Please call Yellowstone Superintendent Dan Wenk during the day on Friday and urge him to stop slaughtering America's last wild buffalo. We want to flood Yellowstone's switchboards. It's been a bad couple of days for America's last wild buffalo. On Tuesday the press was abuzz with news that Yellowstone National Park planned to slaughter as many as 800 buffalo this winter. What the journalists reporting the story did not reveal--because Yellowstone's public relations office kept it from them--was that Yellowstone was already actively engaged in capturing and slaughtering wild buffalo! Yesterday morning, February 12, BFC's Gardiner field patrol was startled to see a livestock trailer leaving the area of the Stephens Creek buffalo trap loaded with 20 previously wild buffalo. The truck and trailer, bearing Montana plates and likely belonging to the Confederated Salish and Kootenai Tribes (CSKT), was escorted by two Montana Department of Livestock trucks and a USDA Animal and Plant Health Inspection Service (APHIS) truck. This convoy traveled north from Gardiner and then headed west on Interstate 90, en route to a slaughterhouse in Ronan, MT, where all 20 buffalo were (or are in the process of being) killed. BFC quickly contacted Yellowstone spokesman Al Nash, who informed us that 25 buffalo had been captured on Friday, February 7, and confined in the trap for five days. After shipping the 20 buffalo to the slaughterhouse, Yellowstone officials turned the remaining five buffalo over to APHIS, who will use them as subjects of an ill-conceived contraception experiment. Today our patrol reported that an additional 30 buffalo had been trapped by park rangers, who baited the Stephens Creek trap with hay to lure the buffalo in and closed the steel doors behind them. 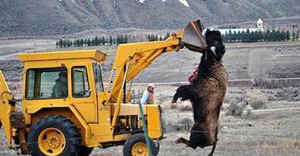 It is likely that the park plans to slaughter these buffalo as well. Yellowstone and its partner agencies have set an arbitrary limit of 3,000 to 3,500 buffalo on the size of the population. This "target," based more on politics than sound science, is meant to limit the range of wild buffalo. It does not reflect the carrying capacity of the buffalo's habitat in and around Yellowstone. The Park Service has even gone so far as to refer to any buffalo above this number as "surplus" animals, hence its plans to kill so many this winter. The current buffalo population numbers approximately 4,400 (1,300 in the Central Interior and 3,100 in the Northern range). Yellowstone estimated the population at 4,600 last summer but 100 have since been killed by hunters and an equal number have likely died due to winterkill and natural causes. The Central Interior subpopulation also migrates north into the Gardiner basin and has not recovered from the last Park-led slaughter in 2008 that killed over half of the Central Interior buffalo. The government’s “population target” makes no distinction for conserving subpopulations in this very unique buffalo herd. 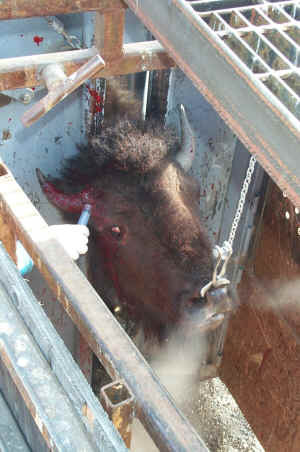 The current slaughter operations have outraged hunters, including parties from the Nez Perce Tribe, who have traveled hundreds of miles to exercise their treaty rights only to find no bison on the landscape. Meanwhile, only a few miles away, Yellowstone captures buffalo by the dozens, holds them for days inside the trap, and ships them to slaughter.